Kenwood are known as the #1 Brand in food processors, that same name brings you the new FPM260. 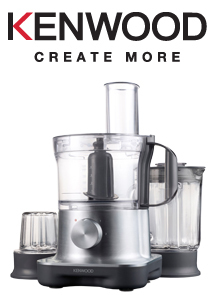 The MultiPro Compact is the new food processor from Kenwood features a 750watt power output and a huge 2.1L bowl capacity. Other features include 2 speeds and pulse settings, dual whisk, dough tool, a glass-chopping mill and 1.2L blender attachment. Reproduce those recipes from your favourite programs with ease.